If you own a Chase Ink Bold or Ink Plus, or a Chase Sapphire card, you can transfer those dollars over to your Ultimate Rewards account and make them even more valuable. Ultimate Reward points are among the most valuable of all the miles and points currency due to their flexibility. You can book travel through the UR website. You get a 25% bonus when you use your points. In other words, 30,000 UR points are worth $375 in travel. When you pay for travel this way, you earn miles and hotel points from the airlines and hotels as if you had paid cash. 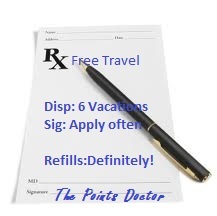 You can also transfer those points directly to some of UR's travel partners. When transferring miles to Southwest or United, you will also receive a 25% transfer bonus. 20,000 UR points gives 25,000 miles. That's good enough to book a low level dometic award ticket. The quarterly promtions are capped at $1500 of spending in the bonus categories, so you max out at 30,000 UR points for the year on these promotions. It's still a great deal. I plan on taking full advantage of the $1500 in the Drug Store spending to max out on the 7500 UR points with the purchase of Vanilla Reload cards! How will you use your bonus points?